Wandering Lies – PURE DC Metro ROCK FURY! PURE DC Metro ROCK FURY! Thank you! Cuba Skate & Feed It FWD!! To the organizers, participants, and guests! THANK YOU! It was a beautiful day, people were fed, skaters were shredding, music was playing, and kids were having fun! Anthony Menez (of RVA Zombies) watching Nam (DCHC band Teamster) float a backside air. Skate It Forward! Feed It Forward!!! Sunday JULY 26th! JOIN US Sunday JULY 26th!! WE HIT THE STAGE AT 4PM!!!!! Feed It Forward DC & Cuba Skate have partnered up together to bring you an AMAZING fundraiser. THIS EVENT IS TOTALLY FREE BUT WE ARE ACCEPTING DONATIONS! 2PM is when the FUN really begins! Thank you Philippine Embassy!! Back to the studio! Our performance at the Philippine Embassy Cultural Festival Open House was a success! Thank you to everyone who showed up, watched some great performances, ate tasty food, and had a great time! Special thanks to Raf Toledo (The Speaks) for performing a couple of classic Speaks songs with us! For more photos visit our Facebook page here! Now it’s back to the studio to record!! We’ll keep you posted! FREE SHOW! Philippine Embassy in DC Cultural Festival 4PM! …and more!!! 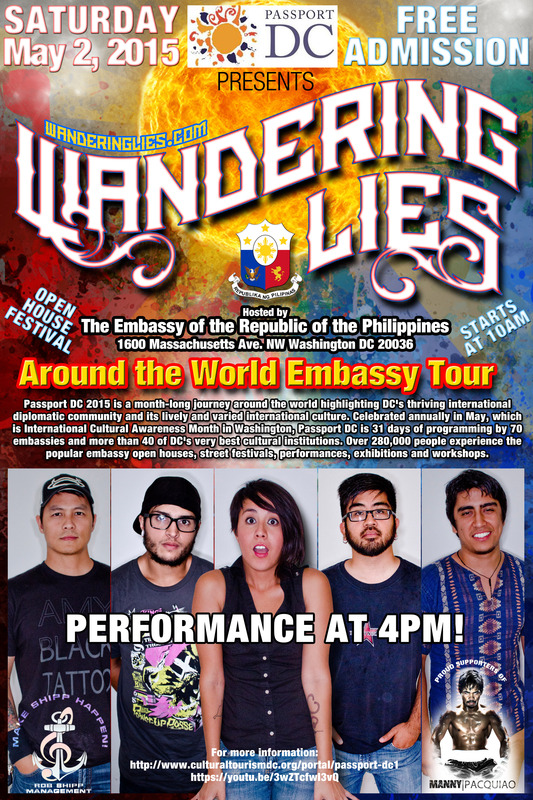 MAY 2nd Wandering Lies will be performing a FREE SHOW at the The Embassy of the Republic of the Philippines cultural Festival Open House presented by Passport DC 2015. It is a month-long journey around the world highlighting DC’s thriving international diplomatic community and its lively and varied international culture. Celebrated annually in May, which is International Cultural Awareness Month in Washington, Passport DC is 31 days of programming by 70 embassies and more than 40 of DC’s very best cultural institutions. Over 280,000 people experience the popular embassy open houses, street festivals, performances, exhibitions and workshops. Maybe we’ll play some old favorites.. trying to secure a little surprise for the show too (don’t hold us to it yet though…). 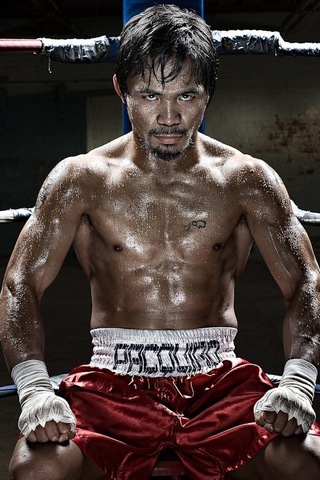 Don’t worry, you’ll get home in plenty of time to watch MANNY PACQUIAO DESTROY Floyd the loser bigmouth nobody! PACMAN defeats Floyd! We told you so! For more info visit PASSPORT DC’s page here! 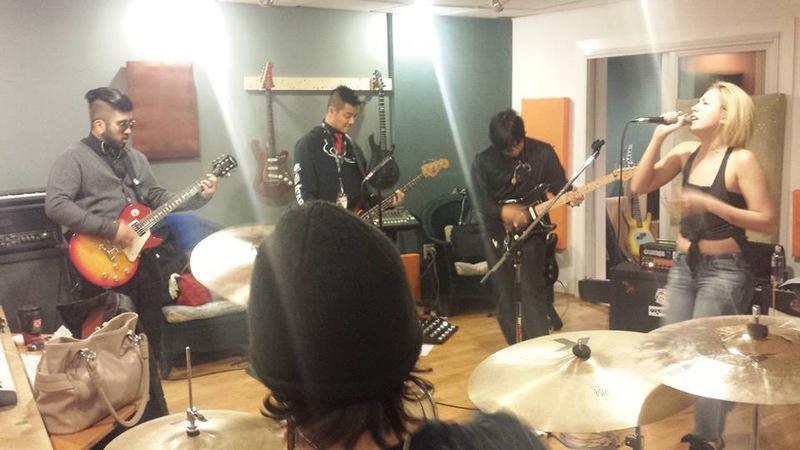 We’ve begun recording! Patience pays off! If you want to see what kind of mischief we get into in the studio and during rehearsal (or whenever) check out our YouTube page click here! Thank you Alex’s Army Childhood Cancer Foundation & Ned Devine’s for hosting this great event! About $7K was raised throughout the event and everyone had a great time! Great music, family fun, and lots of incredible raffle prizes were won! Congratulations to the Vinyl Effect for the win!! Since they donated the grand prize (studio time) it was their wish to concede their win to the runner up band… 2nd place was extremely close (by 1 point) and WANDERING LIES came out on top! We were humbled, and absolutely stunned! There was so much talent that participated that we hadn’t anticipated even coming close to winning! The real winner was ALEX’S ARMY CCF! Having an opportunity to contribute to their event made everyone a winner too! Thank you to everyone who came out and supported this event! Our next step? Studio time. The next show? *Shrug* But we’d like to keep that momentum going.. stay tuned! We woudn’t be very well organized or on-time without our crew!